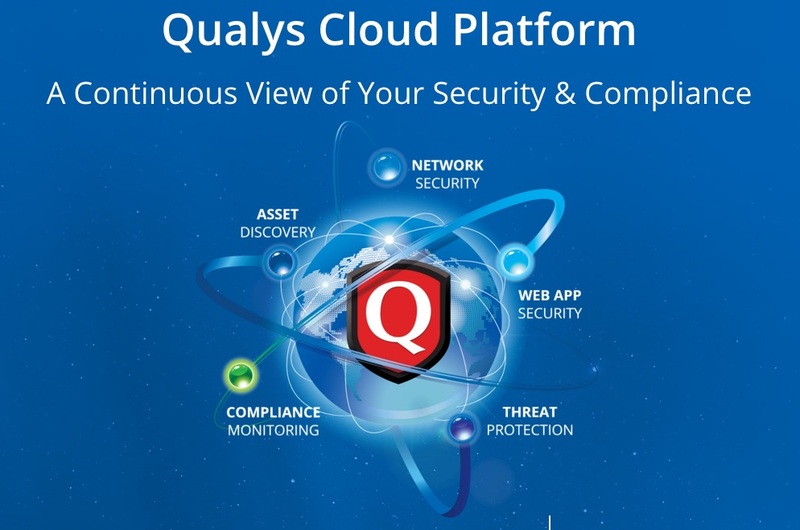 Qualys, Inc. is a provider of cloud security, compliance and related services for small and medium-sized businesses and large corporations based in Redwood Shores, California. Founded in 1999, Qualys was the first company to deliver vulnerability management solutions as applications through the web using a "software as a service" (SaaS) model, and as of 2013 Gartner Group for the fifth time gave Qualys a "Strong Positive" rating for these services. It has added cloud-based compliance and web application security offerings. Qualys has over 7,700 customers in more than 100 countries, including a majority of the Forbes Global 100. E-SPIN have actively in promoting Qualys full range of products and technologies as part of the company Vulnerability Management, Penetration Testing and Security Management. E-SPIN is active in provide consulting, supply, training and maintaining Qualys products for the enterprise, government and military customers (or distribute and resell as part of the complete package) on the region E-SPIN do businesses. The enterprise range from corporate, universities, government agencies to IT service providers on data center, security management, security operation center (SOC), vulnerability management, vulnerability assessment center (VAC) and enterprise information security management / operations. Please feel free to contact E-SPIN for your inquiry and requirement, so we can assist you on the exact requirement in the packaged solutions that you may required for your operation or project needs. 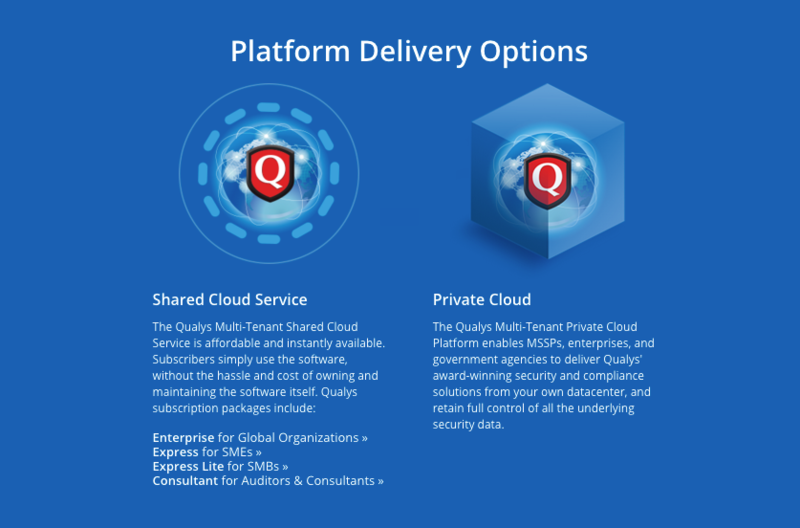 The Qualys Cloud Platform consists of suite of IT security and compliance solutions that leverage shared and extensible core services and a highly scalable multi-tenant cloud infrastructure. Built on top of Qualys' Infrastructure and Core Services, the Qualys Cloud Suite incorporates the following applications, all of which are delivered via the cloud; there is no new software to deploy or infrastructure to maintain. Each application leverages the same scan data. Delivers immediate alerts whenever threats or unexpected changes are found in an organization's Internet perimeter – before they turn into breaches. Discovers all devices and applications across the network, at the same time identifying and mitigating the vulnerabilities that make network attacks possible. Helps organizations pass security audits and document compliance tied to corporate security policies, laws, and industry regulations, supporting the requirements of both internal and external auditors. Expands the scope of risk and compliance data beyond technical vulnerabilities to verify that third-party vendors are in compliance with emerging regulatory requirements. Provides small and medium-sized businesses with enterprise-level scanning and reporting that's easy to implement and maintain, and enabling large corporations to meet PCI compliance requirements for data protection on a global scale. Provides automated crawling and testing for custom web applications to identify vulnerabilities including for cross-site scripting and SQL injection. The automated service enables regular testing that produces consistent results, reduces false positives, and easily scales to secure large numbers of websites. Protects websites against attacks on server vulnerabilities and web app defects. Brings Cloud scalability and simplicity that make it possible to strongly secure web apps against Cross-Site Scripting (XSS), SQL injection, corrupted requests and other attacks in less than 30 minutes. Proactively scans websites of any size, anywhere in the world, for malware infections and other threats, sending alerts to website owners. Enables businesses to scan and manage a large number of sites, preventing website black listing and brand reputation damage. Enables online businesses of all sizes to scan their websites for the presence of malware, network and application vulnerabilities, as well as SSL certificate validation. Merchants can display the Qualys SECURE seal on their website, demonstrating to visitors that the company is committed to security. Qualys Core Services enable integrated workflows, management and real-time analysis and reporting across all of our IT security and compliance solutions. Enables customers to easily identify, categorize and manage large numbers of assets in highly dynamic IT environments and automates the process of inventory management and hierarchical organization of IT assets. A highly configurable reporting engine that provides customers with reports and dashboards based on their roles and access privileges. A configurable workflow engine that enables customers to easily build questionnaires and capture existing business processes and workflows to evaluate controls and gather evidence to validate and document compliance. 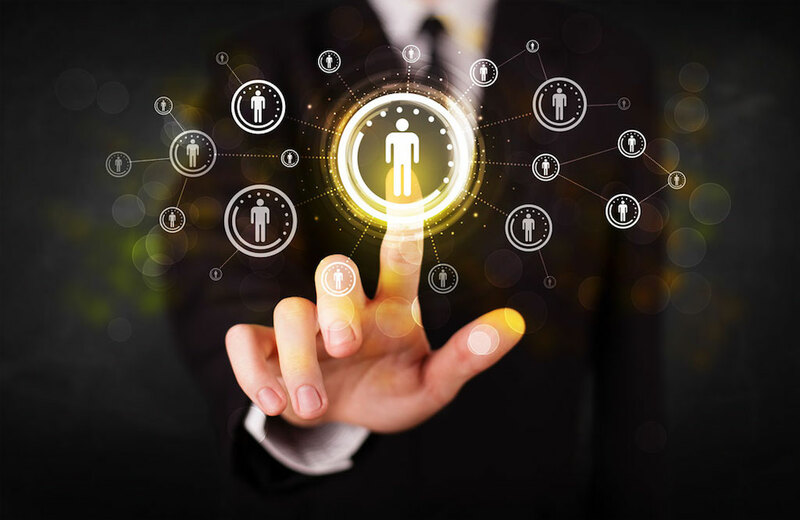 An integrated workflow engine that allows customers to automatically generate helpdesk tickets for remediation and to manage compliance exceptions based on customer-defined policies, enabling subsequent review, commentary, tracking and escalation. This engine automatically distributes remediation tasks to IT administrators upon scan completion, tracks remediation progress and closes open tickets once patches are applied and remediation is verified in subsequent scans. Provides capabilities for indexing, searching and correlating large amounts of security and compliance data with other security incidents and third-party security intelligence data. Embedded workflows enable customers to quickly assess risk and access information for remediation, incident analysis and forensic investigations. Creates email notifications to alert customers of new vulnerabilities, malware infections, scan completion, open trouble tickets and system updates. Qualys infrastructure layer, which we refer to a sour Infrastructure, includes the data, data processing capabilities, software and hardware infrastructure and infrastructure management capabilities that provide the foundation for our cloud platform and allow us to automatically scale our Infrastructure and Core Services to scan millions of IPs. We have designed a modular and scalable infrastructure that leverages virtualization and cloud technologies. This allows our operations team to dynamically allocate additional capacity on-demand across our entire Qualys Cloud Platform to address the growth and scalability of our solutions. Built on top of our secure data storage model, this engine indexes petabytes of data and uses this information in real-time to execute tags or rules to dynamically update IT assets' properties, which are used in various workflows for scanning, reporting and remediation. Qualys relies on our comprehensive repository, which we refer to as our KnowledgeBase, of known vulnerabilities and compliance controls for a wide range of devices, technologies and applications that powers our security and compliance scanning technology. We update our KnowledgeBase daily with signatures for new vulnerabilities, control checks, validated fixes and improvements. As a core service of our cloud platform, Qualys sensors make it easy to extend security through your globally distributed environment. These sensors, which can be in the form of appliances or lightweight agents, are remotely deployable, centrally managed and self updating. To scan externally facing systems and web applications, we host and operate a large number of globally distributed physical scanner appliances. To scan internal IT assets, customers can also deploy our scanners, which are available on a subscription basis as physical appliances or downloadable virtual images, within their internal networks. Qualys Cloud Agents can be installed anywhere — including any host such as a laptop, desktop, server or virtual machine. 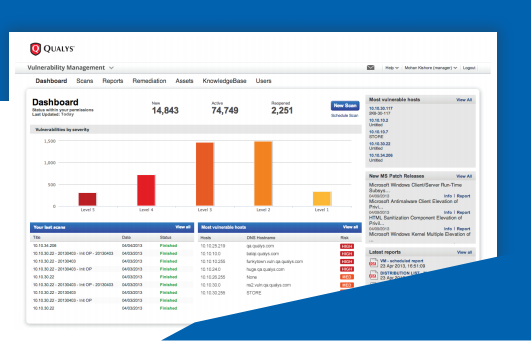 Qualys Cloud Agents extract and consolidate vulnerability and compliance data and update it continuously within the Qualys Cloud Platform for further analysis and correlation, thus providing a continuous view of the security compliance posture of the global network. Our cloud agents and scanner appliances self-update daily in a transparent manner using our automated and proprietary scan management technology. 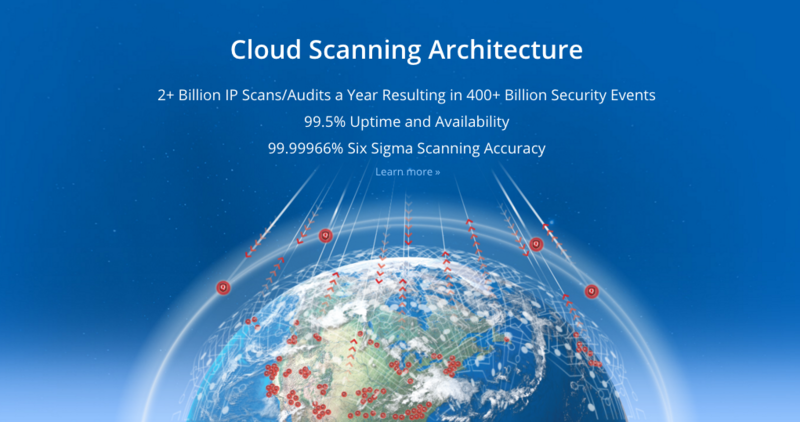 These sensors allow us to scale our cloud platform to continuously scan networked devices and web applications across organizations' networks around the world. Qualys Internet Scanners provide fast and efficient external scanning. Qualys hosts a collection of Internet Scanners optimized to scan publicly facing devices globally via the Internet. In this manner, Qulays scans and processes security audits in parallel for optimum speed of operations. The inference-based scanning engine employs an un-trusted approach for greater accuracy nd scalability, delivering both accurate results and scalable performance. Qualys Scanners are appliance versions of the Internet Remote Scanners. Scanners enable customers to bring Qualys assessment capabilities to their internal networks. Installed in minutes and requiring no maintenance by the user, the hardened Linux appliance needs no special firewall configurations to obtain updates and new vulnerability signatures and perform scan jobs, returning results securely over a standard SSL-encrypted channel. Qualys software-based virtual scanner appliances are qualified to run on many of the most common virtualization and cloud platforms including VMware and Amazon EC2. These virtualized scanners supplement the current hardware-based Qualys Scanner Appliances. Like with the hardware-based scanners, customers can manage the virtual scanners from their Qualys accounts via a secure web interface, where all gathered scan data will be available for reporting and remediation. Installed in minutes and requiring no maintenance by the user, scanners needs no special configurations to obtain updates and new vulnerability signatures. If interested on the product solution, feel free to contact E-SPIN for project and operation requirement. Continuous Monitoring enables customers to have the most comprehensive and up-to-date view of their entire organization. It detects changes in your network that could be exploited and immediately notifies the IT staff responsible for the affected assets so they can take appropriate action. Continuous Monitoring is designed specifically to be efficient and easy to use. It scales from one to a million users, from a single office to a global network. Qualys Continuous Monitoring (CM) works together with Qualys Vulnerability Management (VM) to provide true proactive network security. From a single console, user can explore hosts and digital certificates, organize assets by business function or technology, and set up automated, targeted alerts-for systems anywhere in the world. Qualys Cloud Platform keeps everything in sync, avoiding the redundancies and gaps that come with trying to glue together disparate, siloed solutions. Automated Monitoring of your Global Perimeter Continuous Monitoring efficiently tracks the systems in your global network, whether they are in one location, located in cloud environments, or spread across the globe. It monitors user critical internal IT assets such as desktops, servers, and other devices. 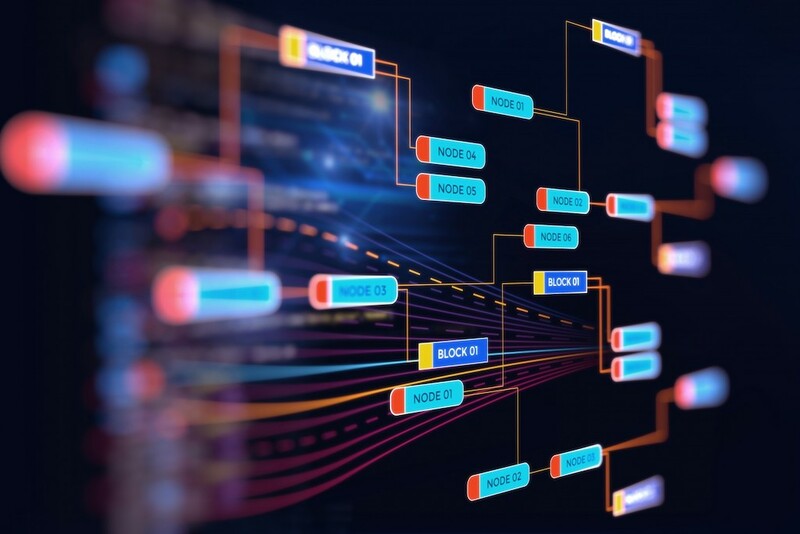 Continuous Monitoring can tailor alerts to a wide variety of conditions so that the user can watch broadly for general changes or zero in on specific circumstances. 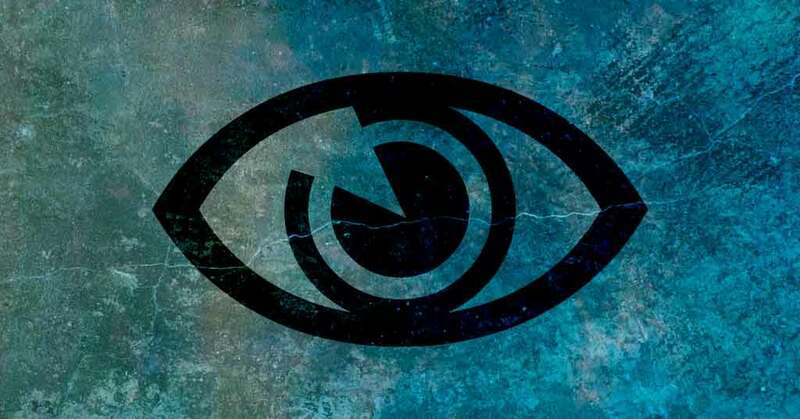 User can immediately see the big picture on their network with Continuous Monitoring's visual dashboard. 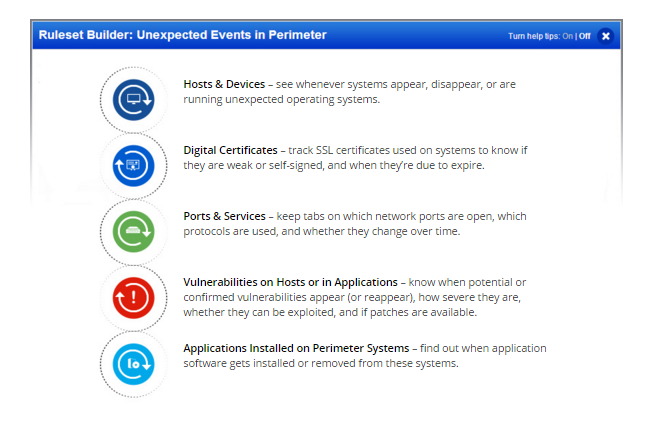 A quick overview and graphical representation of recent activity helps you spot anomalies, flag important alerts or hide ones you don't want to see. Then, find particular alerts quickly with rich interactive search, and drill into the details with a simple click. Qualys Malware Detection (MD) allows organizations to proactively scan their websites for malware, providing automated alerts and in-depth reporting to enable prompt identification and resolution. Qualys MD enables organizations to protect their customers from malware infections and safeguard their brand reputations. Qualys MD enables businesses to scan and manage a large number of sites, preventing website black listing and brand reputation damage. Organizations that use MD will be able to quickly identify and eradicate malware that could infect their website visitors and lead to loss of data and revenue. MD supports regularly scheduled scanning to monitor websites on an ongoing basis, with email alerts to quickly notify organizations when infections are discovered. Malware infection details are provided so that organizations can take quick action to isolate and remove malware. Built on the world’s leading cloud-based security and compliance platform, Qualys MD requires no special hardware and can be set up with a few simple clicks. Qualys SECURE Seal is a new service that allows businesses of all sizes to scan their web sites for the presence of malware, network and web application vulnerabilities, as well as SSL certificate validation. Once a web site passes these four comprehensive security scans, the Qualys SECURE Seal service generates a seal for the merchant to display on their web site demonstrating to online customers that the company is maintaining a rigorous and proactive security program. 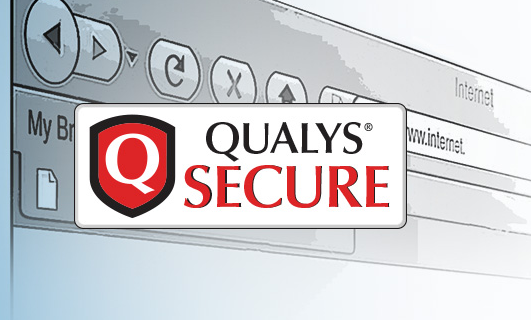 Leveraging QualysGuard's award winning scanning technology, Qualys SECURE Seal is the only web site security testing service that extends the ability to scan web site(s) for malware, network and web application vulnerabilities, as well as validating the web site's SSL certificate. Fast Cloud Deployment-for Public or Private Cloud Applications Get benefits of the cloud for web application security. No special hardware to buy or maintain. Deploy virtual machine images of Qualys WAF appliances alongside web applications. Works in public or private cloud environments, including Amazon EC2 and VMware vCenter. Scales seamlessly for adding new applications quickly and transparently. Protection Virtual Patching and Event Response Create “virtual patch” rules to address Qualys WAS findings,enable rapid resolution of false positives, and customize security rules for your environment. Easy-to-use, adaptive security policies are always up to date. Customizable protection against current and future threats. Protection against clickjacking, cross-site scripting (XSS), and other browser-based attacks. Blocking access from prohibited networks. Preventing transmission of sensitive content or files. Information Provide your security team with continuous application security monitoring for accurate insight into risks affecting your web applications, and a clear path to remediating those vulnerabilities before a breach occurs. Visual dashboard shows status at a glance. It summarizes events that occurred, when they occurred, and where they came from, to help teams spot unusual patterns. Interactive insights into potential threats. A variety of attributes helps you assess severity and search for unusual activity. Detailed understanding of each threat. Investigate suspicious activity by drilling into your data and the Qualys KnowledgeBase for actionable insight. Qualys Vulnerability Management (VM) is a cloud-based service that gives you immediate, global visibility into where your IT systems might be vulnerable to the latest Internet threats and how to protect them. It helps you to continuously identify threats and monitor unexpected changes in your network before they turn into breaches. Built on the world’s leading cloud-based security and compliance platform, Qualys VM frees you from the substantial cost, resource and deployment issues associated with traditional software products. Known for its fast deployment, unparalleled accuracy and scalability, as well as its rich integration with other enterprise systems, Qualys VM is relied upon by thousands of organizations throughout the world. Qualys VM is the industry’s most advanced, scalable and extensible solution for continuous vulnerability management and compliance. Its capabilities are powered by the Qualys Cloud Platform. Scales up globally on demand and is deployed from a public or private cloud fully managed by Qualys. Continuously scans, accurately identifies vulnerabilities, prioritizes them and helps you protect IT assets on premise, remote or mobile, or in EC2 and Azure elastic cloud environments. Executive Dashboard provides a summary of overall security posture and instant access to details about remediation. As a cloud-based solution, Qualys VM is always up to date. Integrates with other systems via Qualys APIs. 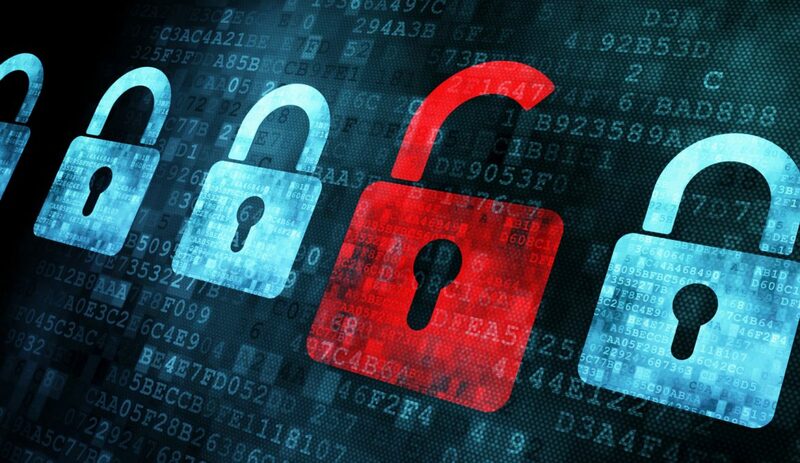 End-to-end encryption and strong role-based access controls keep your security data private. Centrally manages user logins with SAML-based enterprise Single Sign On. Comprehensive, flexible reporting provides rolebased visibility on security – including automatic security documentation for compliance auditors. Discover Qualys VM uncovers new or forgotten devices and uses dynamic tagging to organize your host assets by role to the business. Visually maps every device and application on the network. Details each device by OS, ports, services and certificates. 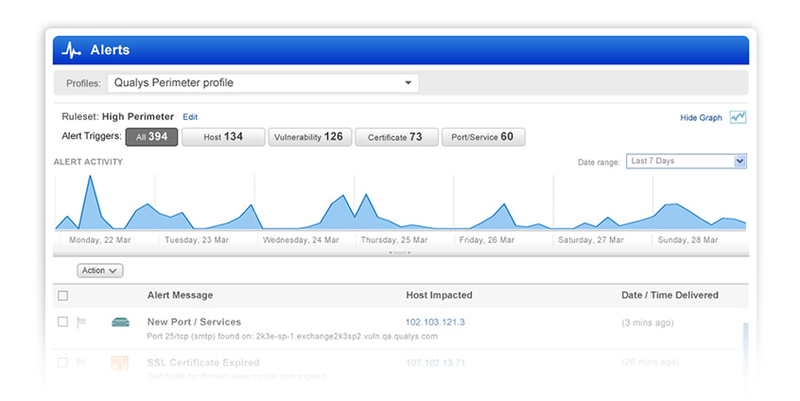 Assess Qualys VM accurately and efficiently scans for vulnerabilities everywhere. Scanning provides accurate, prioritized results. Includes devices and applications on perimeter and internal networks, and elastic cloud networks. Prioritize Identify the highest business risks using trend analysis, zero-day and patch impact predictions. Our KnowledgeBase puts critical issues into context. Qualys VM helps you spot trends, see what’s changed and accurately predict which hosts are at risk – even for zero-day attacks. 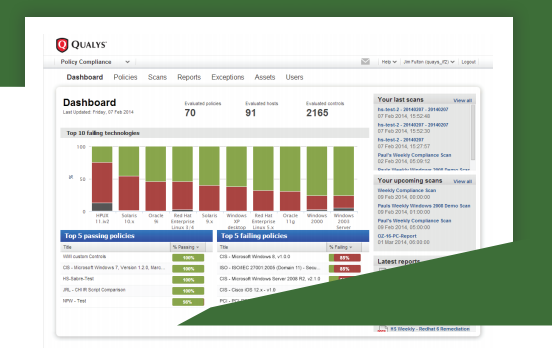 Remediate Monitors vulnerabilities and their remediation process. Qualys VM keeps track of everything so your team can work efficiently and stay in control. Automatically assigns remediation tickets and manages exceptions. Provides lists of patches by priority for each host and manages exceptions. Integrates with existing IT ticketing systems. Inform Customized comprehensive role-based reports document progress for IT, business executives and auditors. Lets you report anytime, anywhere – without rescanning. Provides context & insight, not just a data dump. 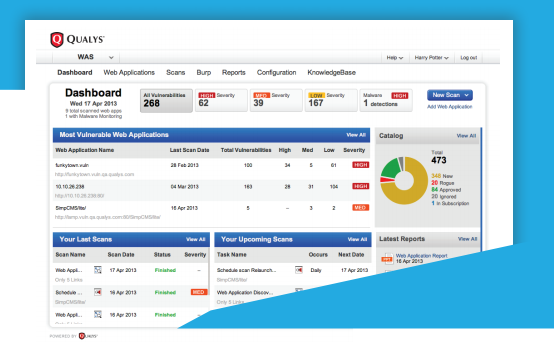 Shows ongoing progress with your vulnerability management goals. XML-based APIs integrate reporting data with GRC, SIEM, ERM, IDS and other security and compliance systems. Inadvertently open ports and services. Severe vulnerabilities on hosts or in applications. Undesired software on perimeter systems. 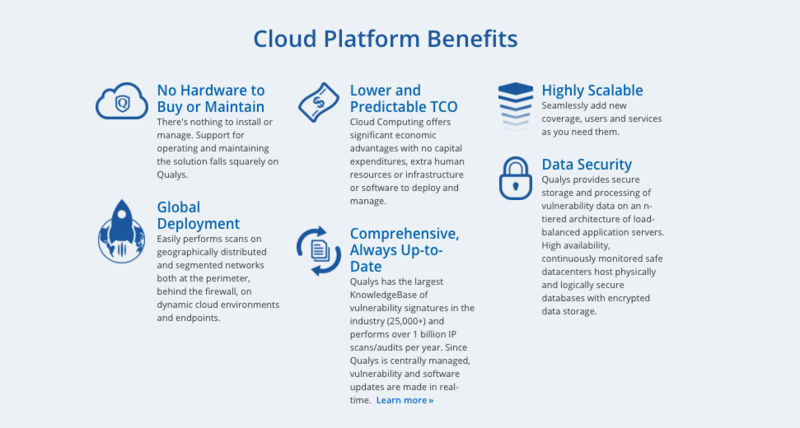 Qualys Cloud Platform Revolutionize both security and compliance with the industry’s most integrated, scalable and extensible cloud platform. Deploy immediately from a public or private cloud – fully managed by Qualys and always up-to-date. Scales up globally, on demand. Centralize discovery of host assets for multiple types of assessments. Organize host asset groups to match the structure of your business. Define Policies Interactively set up IT standards for hardening configurations and complying with relevant regulations. Define configuration policies required for different environments and assets. Draw from a built-in library of extensively used policies certified by CIS, including COBIT, ISO, NIST, ITIL, HIPAA, FFIEC, NERC-CIP and User Defined Regulatory Cross Reference. Create custom policies via an interactive web-based editor. Import and export policies to share with other subscriptions. 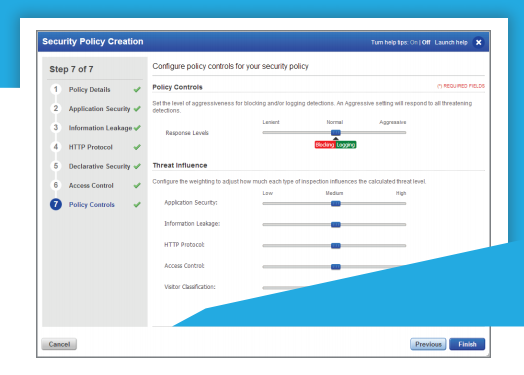 Select host and application settings to automatically check for each policy. Interactively choose which configuration settings to monitor. Select from a rich library of controls for OSes, network devices, databases and applications. Create custom controls without writing code or scripts. Test controls immediately without rescanning or reporting. Monitor the integrity of files and watch for changes. See how controls relate to critical frameworks and regulations. Scan and analyze OS and application configurations on each target host. Scan anywhere on premise, or in private or public clouds from a single console. 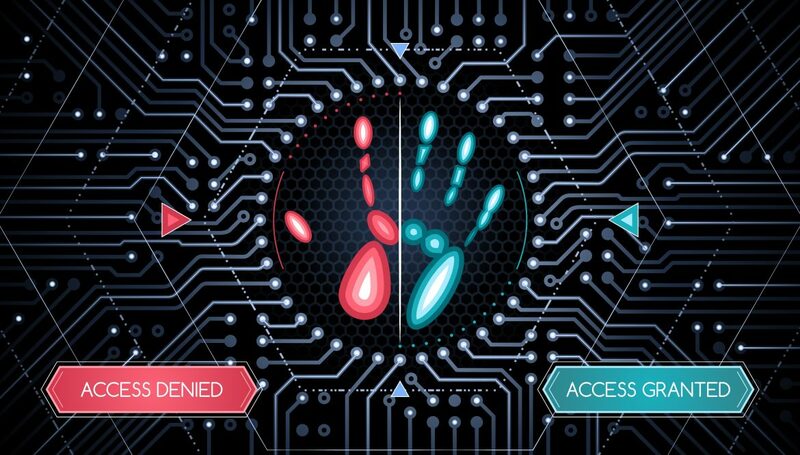 Scan behind your firewall securely with Scanner Appliances managed by Qualys. Scan quickly and efficiently on demand or on a schedule. Store configuration information offsite with secure audit trails. Assess deeply with authenticated scans. Remediate Fix violations and configuration “drift” early – before audits – and manage exceptions centrally. Catch configuration “drift” while it’s easy to fix. Manage exceptions via a documented approvals process. Be confident that audits will show compliance, not uncover violations. Inform Customize comprehensive reports to document progress for IT, business executives, risk managers and auditors. Report any time, any place – without rescanning. Document that policies are followed and lapses get fixed. Enable data-driven risk and compliance management. Qualys Malware PCI Compliance (PCI) provides businesses, online merchants and Member Service Providers the easiest, most cost-effective and highly-automated way to achieve compliance with the Payment Card Industry Data Security Standard. Known as PCI DSS, the standard provides organizations the guidance they need to ensure that payment cardholder information is kept secure from possible security breaches. Qualys PCI draws upon the same highly accurate scanning infrastructure and technology as Qualys’ flagship solution, Qualys Vulnerability Management – used by thousands of organizations around the world to protect their networks from the security vulnerabilities that make attacks against networks possible. Note: even if your organization is not a typical “merchant,” it is required to comply with PCI DSS if it processes, stores or transmits payment card data. See PCI DSS for merchant and service provider levels and validation actions required for compliance. As part of the award-winning Qualys Cloud Platform, Qualys PCI enables merchants and service providers of any size to deploy immediately and attain compliance as quickly as possible. Immediate deployment – no hardware to set up, always up-to-date. 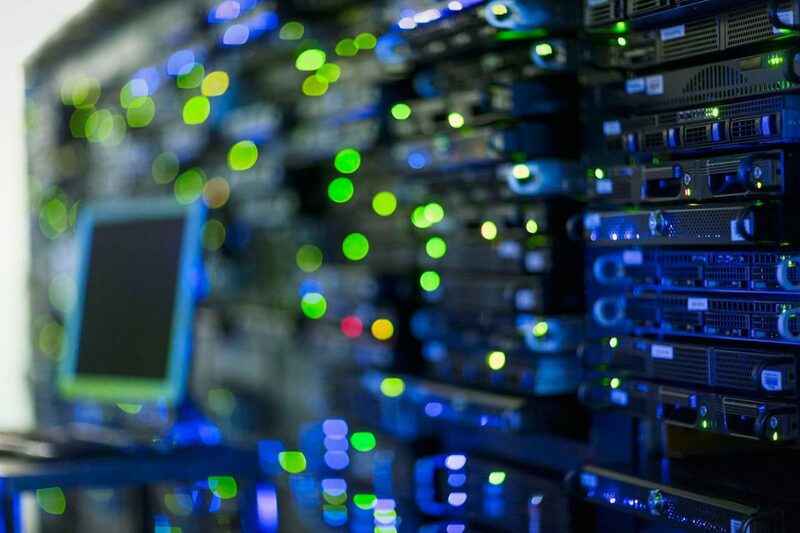 Global scalability – add more security applications anytime, throughout the world. Multiple, unified solutions – one console for PCI, VM, WAS and more. Centralized management applies policies consistently across applications. Through Qualys PCI, achieving PCI compliance status becomes a streamlined process that also provides the assurance that your network is highly secure. Easy-to-follow step-by-step approach & compliance tips. Required quarterly scans are automatically completed; scan as often as you like. User-friendly interface, online help and 24x7x365 email/telephone support ensures success in understanding and achieving PCI compliance. Scans all assets on-premise and in private, public or hybrid clouds. 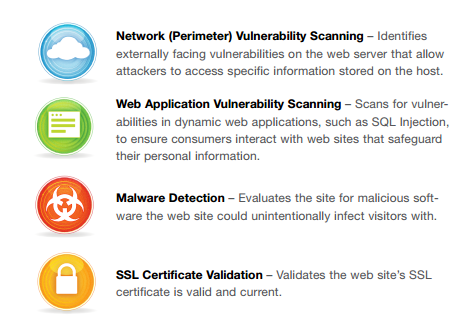 Scan vulnerability types within any application (built or customized in-house or purchased). Conduct authenticated and unauthenticated scans. Automates and greatly simplifies scanning and remediation. 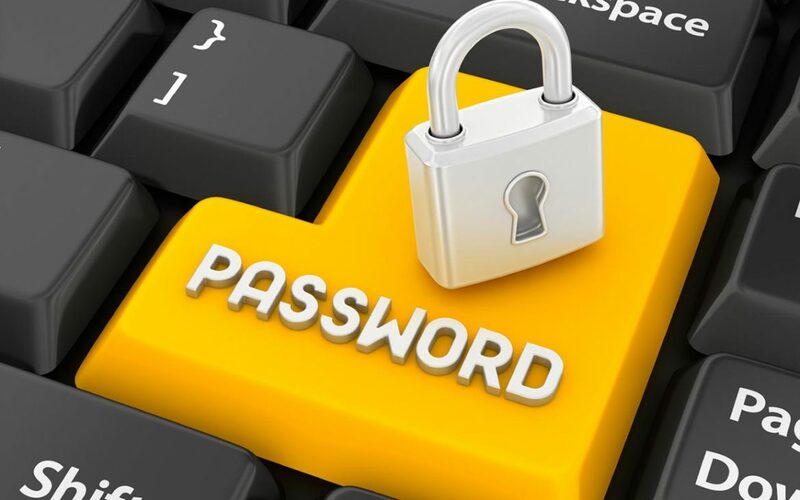 Provides easy-to-use reporting of vulnerabilities that will cause you to fail PCI DSS. 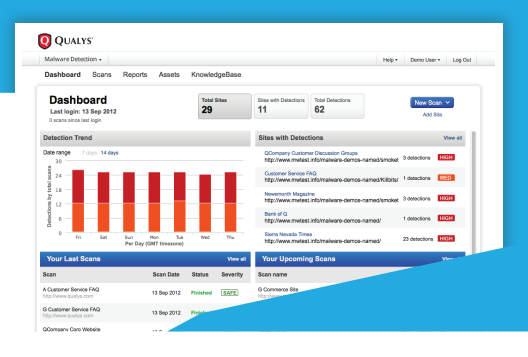 Uses the Qualys Cloud Platform for accurately scanning vulnerabilities. For each vulnerability discovered, Qualys PCI provides detailed instructions with links to verified patches for rapid remediation. Submit – Auto-Submit Compliance Status Directly to Acquiring Bank Once you have met the validation actions, the Qualys PCI “auto-submission” feature completes the compliance process. Automatically submits compliance status directly to your acquiring banks. Download PCI compliance reports in PDF to submit to your acquiring bank(s) or to assist in remediation efforts.